Dollar for dollar, we have found this to be the best deal for a hobby greenhouse on the market today. After setting up and testing the Grandio Elite greenhouse, we are hard pressed to find anything we didn't like. The key features of the Grandio Elite that led us to award it our #1 Rating and Top Pick are the following: attractive looks, tall barn-style roof, heavy duty frame, 10mm thick twin wall panels, variety of size options, easy assembly, and included accessories. 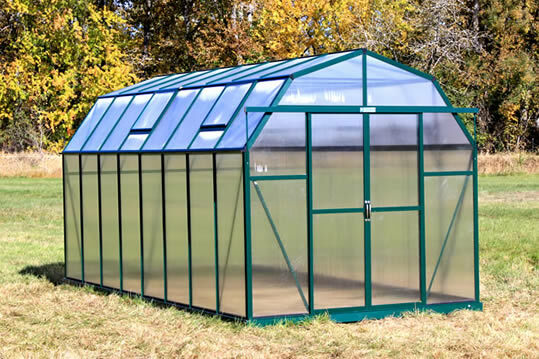 Attractive Looks - With it's barn-shaped roof, tall 8' height, and dark green frame with nice thick profile pieces, the Grandio Elite truly is a nice looking greenhouse. 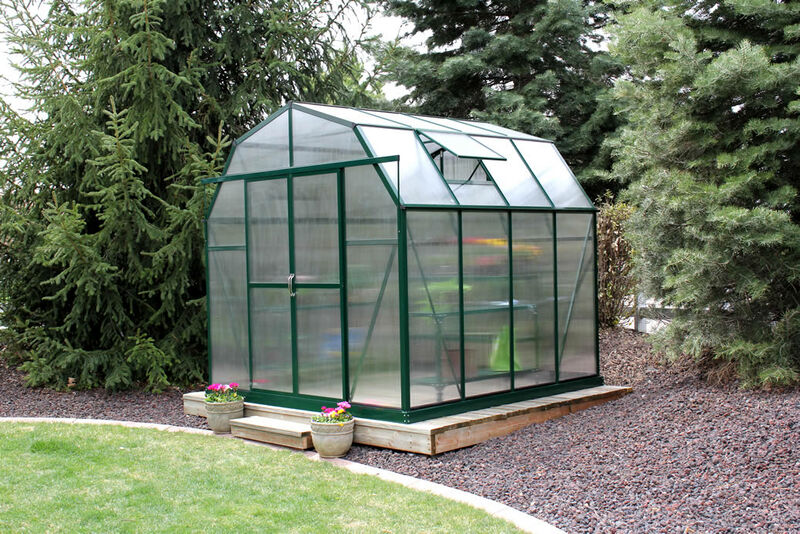 This may seem like a minor thing to some gardeners, but if you are setting up a greenhouse on your property and plan on seeing it nearly every day for the next decade or so, it certainly is nice to have one that looks great! The pictures don't really do it justice - it is a very attractive greenhouse and the coloring and shape blended nicely against the background of our trees and lawn. And with the frame being powder-coated green (not simply painted like some kits) the color shouldn't fade over time or darken and get blotchy. We love the look of wood-framed greenhouses but they suffer the same fate as wood fences and fade or turn gray and look worse every year unless you sand and re-stain them. The Grandios will look great for years with virtually no maintenance aside from maybe a hose down now and then to wash off the dirt. 8' Tall Barn-Style Roof - The Grandio Elite gives even the tallest person plenty of headroom. It has an 8' peak height and barn shaped roof line. 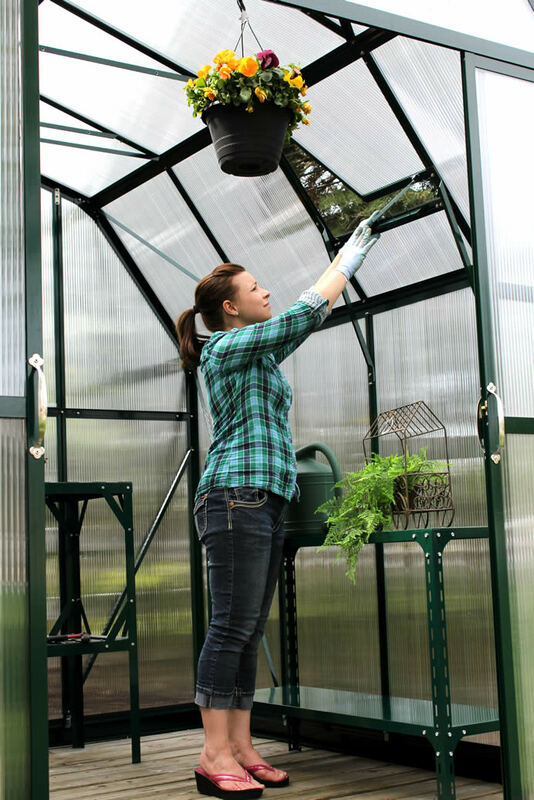 This maximizes the vertical space inside the greenhouse and allows you to stand fully upright when working inside it, even if standing just about against the walls. Many other greenhouse kits will come with peak heights in the 7' to 6' range. That can be okay, but realize that it might mean more crouching and ducking. The height of the Elite also gives you that much more room to do hanging plants, racks and stacking tables, taller plants, etc. Heavy Duty Aluminum Frame - The Grandio Elite has an impressively thick and sturdy aluminum frame - a quality level that you would expect to see on $5000+ kits. The frame quality of greenhouse kits varies quite a bit and the Grandios are definitely one of the stronger frames we've seen. 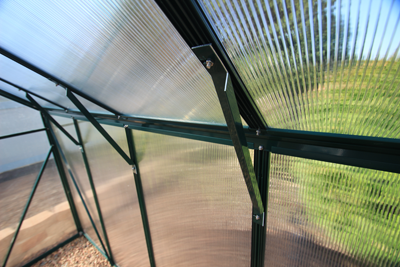 The frame pieces on metal greenhouses are an area that some manufacturers will try to cut corners and save costs. This can lead to a low sales price, but that can be deceiving when you get one of these and realize that you need to go to your local hardware store and spend $500 to buy reinforcements to keep the cheap greenhouse from blowing over or collapsing when the first fall leaf lands on it.Grandios are designed with heavy frames that will last for years. They come included with snow load supports and cross-brace frame supports. 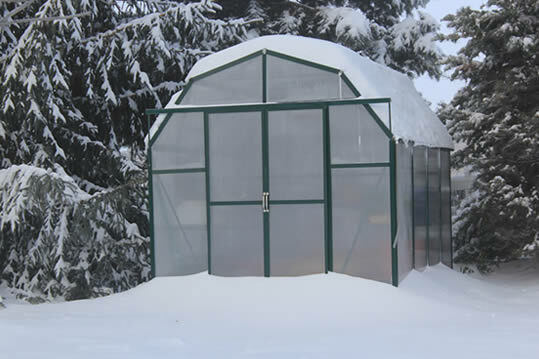 These help keep the greenhouse as rigid as possible and will spread out loads and stresses from winds and snow that may accumulate on it (although from what we can tell only the very top of the roof would gather much snow and we doubt it would ever be enough weight to cause problems.) 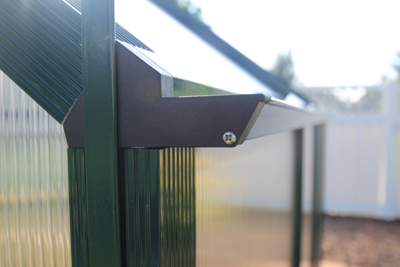 We also like the fact that the aluminum frames will never warp from heat or rust from moisture. 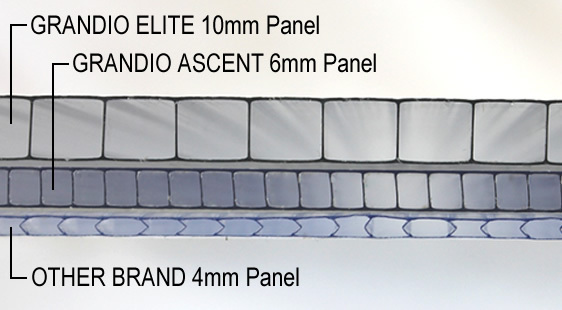 10MM Thick Twin-Wall Panels - The panels on the Grandio Elite are some of the thickest we've come across on a hobby greenhouse. The whole idea of a greenhouse is to provide a climate controlled environment, and the thicker your panels the more insulation you will have and the easier it will be to both heat and/or cool it. This adds up to money saved on electricity or fuel and a better more stable growing enviroment. We urge you to look around at other hobby greenhouses and you will soon see that many of them come with twin-wall panels that are only 4mm thick - which means the Elite panels at 10mm are 2.5 times thicker! 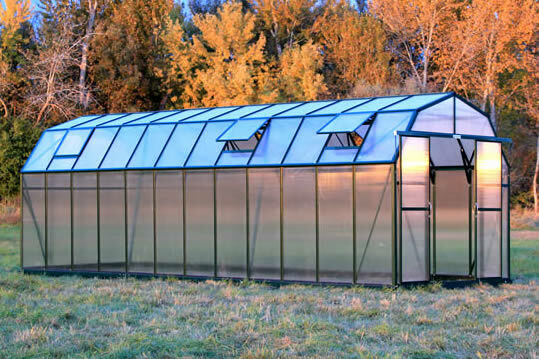 Like the frame, the panels on the Elite are something that we would expect to see on a much more expensive greenhouse, like maybe the Riga V.
Size Options - The Grandio Elite is available in the following sizes: 8x8, 8x12, 8x16, 8x20, and 8x24. This is a great range of lengths and most gardeners should find a size that will fit their need. The greenhouses are also expandable, so if you were to get an 8x12 then decided you really needed more space you could simply order 4' extensions to turn your 8x12 into an 8x16 or bigger. 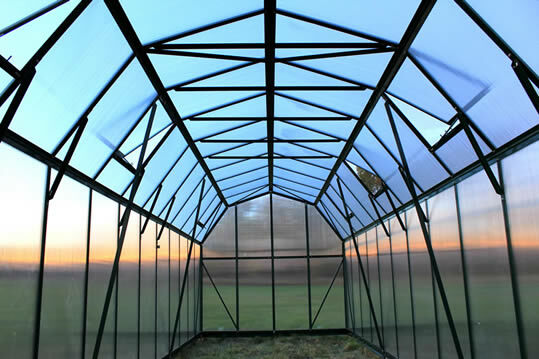 Most greenhouses don't have this option, so it is certainly something to consider if you aren't sure of future size needs. 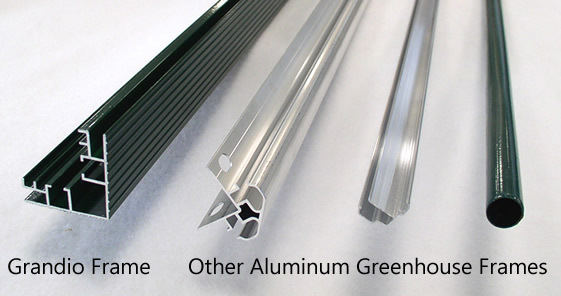 Easy Assembly - Most, if not all, greenhouse kits will promote themselves by saying they are easy to assemble... after having assembled nearly a dozen different kits we can state quite adamantly that "easy assembly" varies greatly. We hate to bash brands and name names, but there are some greenhouse kits that when you open the boxes it looks like you've just ordered a 1000 piece jigsaw puzzle. The Grandio on the other hand was not bad at all. It still takes a good few hours, but it has nicely done instructions, well labeled parts, and pieces that go together easily and simply. We even had a couple little helpers at one point (before they lost interest and started making mudpies) but even our kids were able to help hold pieces and screw in the nuts and bolts. 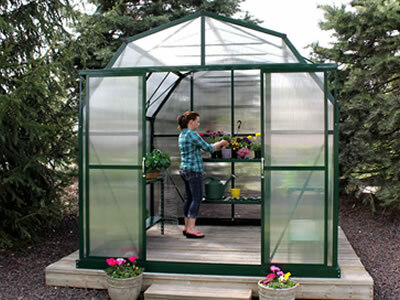 Included Accessories - The accessories that come with a greenhouse should not be overlooked when shopping around. The Grandio Elite comes standard with a base kit, rain gutters, roof windows, snow load kit, and side supports. We chose the Premium package and that had all those accessories just listed plus some automatic roof window openers, plant clips, trellis kit, and a drip kit. We could also have added in some staging tables and benches, but since we've already got plenty of those we didn't get them this time. You can keep it simple or go all out and get all the accessories. Everything we got worked great and we had no problems. Conclusion: The Grandio Elite is a phenomenal greenhouse for the money. It impressed us with it's strength and durability, with it's super-thick and insulating panels, with it's nice looks, and variety of accessory options. Finally, it also has a very reasonable price, which can save the average buyer hundreds or even thousands of dollars or more over similar sized greenhouses from other manufacturers.